Thanks to the presence of several healing enzymes, papaya has always been a great choice for making highly beneficial facemasks. Papaya for face mask is a great idea because it has the power to heal your irritated and sunburned skin. You really need to apply a papaya mask more often if you spend a lot of time out in the sun. The enzymes found in papaya play a big role in fighting free radicals, which in turn will help slow down the aging of your skin, even if you're regularly exposed to the sun. The best thing is that you don't have to spend a lot of time making a papaya mask and that's what makes it an even better choice for someone looking for a way to improve her skin. Papaya for face will help you have better skin because it contains vitamins C, A, and E with several antioxidant properties. Its regular use will keep your skin hydrated and eliminate dark spots, acne, and other skin blemishes. It also improves your skin elasticity by boosting collagen production. The presence of alpha hydroxyl acids gives papaya exfoliating properties that help you get a youthful glow on your skin. It also contains an enzyme called papain that helps remove dead skin cells and get you healthy-looking skin. You already know the benefits of papaya, but another great thing is that it has a rich texture, which is the reason why you face no issues when applying pureed papaya to your skin. This papaya facemask works because it also includes honey, which has unmatched moisturizing effects. It keeps your skin hydrated and uses its antimicrobial properties to clear acne-causing bacteria. The use of lemon juice also rejuvenates your skin because it contains vitamin C and antioxidants. This papaya mask will also help reduce the appearance of ace, wrinkles, and age spots. Chop 1/4 papaya into small pieces and put them in a blender. Add a one spoon of lemon juice and a tablespoon of honey to it. Blend it well to get a fine paste. Wash your face and apply this paste directly on your face. Rinse it off after 15 minutes with warm water and splash cold water on your face to get fresh skin. This papaya facemask is suitable for any skin type. The mask also uses yogurt that contains acidophilus, which has anti-inflammatory properties and creates a soothing effect on your skin. Thanks to its ingredients, it exfoliates your skin, hydrates it, and makes it look young as well. Mix papaya and honey together and add rice powder as well. Now, add yogurt. Blend all these ingredients well in a bowl and apply on your skin when it becomes smooth and pink. Apply a thin layer of it on your face and leave for 20 minutes. Use tepid water to clean your face. The biggest benefit of this papaya mask is that it has a bleaching effect on your skin. It lightens your skin and produces a great glow as well. The combination of pineapple and papaya also helps get rid of dry, scaly skin to make your skin look fresh. Put mashed papaya and pineapple juice in a small bowl and use fork to mash it well. Mix it until it turns into a smooth paste. Apply it on your face and rinse it off after 20 minutes. Use a moisturizer afterwards. Be sure to use milk as the mixing liquid if your skin is sensitive. Apply this facemask once a week for better effects. It is a great facemask to exfoliate your skin and stimulate circulation, which in turn will help you get softer, flawless skin. It really works amazingly well to help you get rid of premature wrinkles, fine lines, and dark spots. It reduces pigmentation as well. 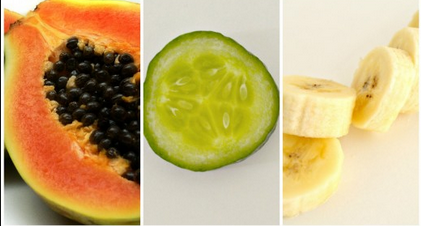 Take 1/4 of ripe to overripe papaya and put it in a blender with banana and cucumber. Blend it well and slather it on to your face. Use warm water to rinse it off after 15 minutes. Finally, use cold water to remove the mask completely. Use a towel to dry your face. Here are some interesting tips to help you make the abovementioned papaya facemasks even effective. Steam your face first and then apply the mask to make it more effective. Whenever you use honey, be sure to use organic instead of processed honey to avoid irritating your skin. Be sure to rinse your mask off when it dries completely. You can also rub papaya peels directly on your skin and wash it off after a few minutes to get fresh skin. Include papaya in your diet because the regular use of this fruit will help you see several health benefits. Server responsed at: 04/20/2019 7:07 p.m.